TORONTO, ON--(Marketwired - March 31, 2016) - Aon plc (NYSE: AON), the leading global provider of risk management and human resource consulting and outsourcing, today released results of its pension plan solvency survey for the first quarter of 2016, which found that the health of Canadian defined benefit (DB) pensions has declined so far this year. Overall pension solvency dropped by 4.5 percentage points through the quarter, as currency volatility, weak international equity performance and slightly lower bond yields more than offset recovering domestic assets. Sharp volatility in exchange rates and risk-seeking assets marked the period, and served as a reminder to pension plan sponsors that downside risks to solvency remain. The Aon survey, which measures plans' assets over liabilities to calculate their solvency funded ratio, is based on results from a total of 449 Aon Hewitt-administered DB pensions from the public, semi-public and private sectors. 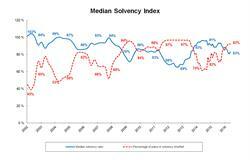 Median solvency on March 29, 2016, was 83.1%, compared with 87.6% at the end of the previous quarter. Sharp volatility marked the period. 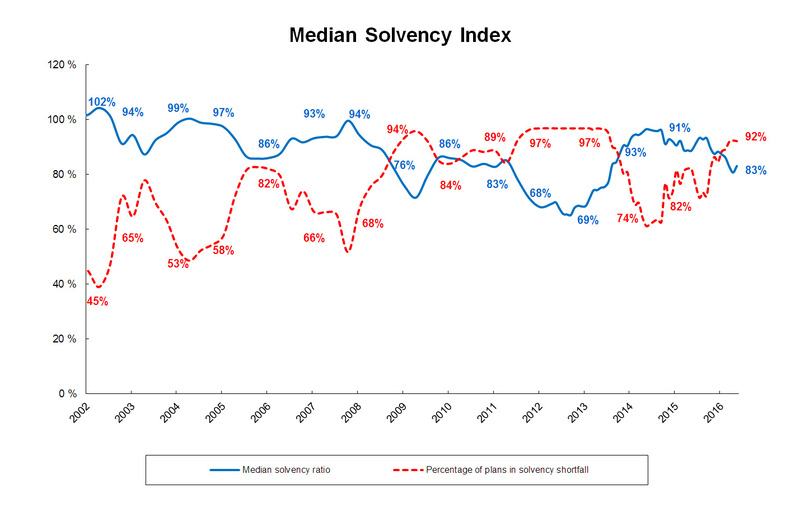 In fact, the solvency ratio probably dipped to lower than 80% in mid-February, before a late-stage rally in equities and slowly improving bond yields saw it rise through March. Still, the proportion of surveyed plans that were fully funded at quarter-end fell to only 8%, down from 11.8% in the previous quarter. The quarter also highlighted the impact of fluctuating exchange rates on pension health. Last year, plans benefited from declines in the Canadian dollar because they were highly exposed to U.S. and global assets. So far in 2016, however, the trend has reversed, as the loonie staged a comeback from US$0.69 in mid-January to US$0.77 in late March. That diminished returns from non-domestic pension assets. In fact, a theoretical plan fully hedged against currency risk with a ratio of 87.6% at the beginning of the semester would have finished the quarter with a solvency ratio of 83.9%, nearly a full percentage point ahead of plans with unhedged currency exposure. "Uncertainty in global economies is causing volatility in commodities and currency, as well as raising concerns about equity valuations and interest rate direction," said Ian Struthers, Partner, Investment Consulting Practice. "In these kinds of markets, it is important for pension funds to maintain a long investing view and manage exposures accordingly. For instance, foreign-denominated assets in pension portfolios reduce overall volatility over the medium and long term. While gains in performance last year were erased by the impact of a stronger loonie this quarter, clients who used smart hedging and other de-risking strategies mitigated volatility. We expect volatility in debt and equity markets to continue through 2016, so sound risk management will continue to benefit Canadian plans going forward." Roller-coaster equity markets, which plunged to fresh lows in January but recovered in late February and March, also drove volatility in the quarter. Domestic equities performed relatively well, returning 4.0%, while FTSE TMX Universe and Long Term Bonds returned 1.5% and 2.8%, respectively. In Canadian dollar terms, U.S. and international equities fared poorly, however. The U.S. S&P 500 total return was -4.2%, while international equities returned -9.4%. Global equities (-6.3%) and emerging markets (-2.5%) also finished the quarter in negative territory. The strengthening Canadian dollar contributed to this poor performance, however, as U.S. and emerging markets returned 1.1% and 1.5%, respectively, in local currency. Declining bond yields, which effectively lower the discount rate pensions apply to liabilities, also contributed to weaker plan solvency. The Government of Canada 10-year benchmark bond yield fell to 1.18% as of March 29, down from 1.39% at the start of year; however, the benchmark rate has climbed steadily from its low of 1.0% in mid-February. "For many plan sponsors, this volatility could translate into unwanted surprises in organizations' cash positions, as well as their financial statements," said Will Da Silva, Senior Partner and National Retirement Practice Leader, Aon Hewitt. "Sponsors need to prepare and manage their retirement programs more comprehensively, using all the levers they have in their risk management toolkit -- not just their investment policy, but also adjusting their funding and benefit strategies. In addition, we expect changes in the Canadian pension landscape, as pensions are very top-of-mind for policymakers these days. We may well see regulatory changes and public plan enhancements in the months to come." Aon's Median Solvency Ratio measures the financial health of a defined benefit plan by comparing total assets to total pension liabilities in the event of plan termination. It is the most accurate and timely representation of the financial condition of Canadian DB plans because it draws on a large database and reflects each plan's specific features, investment policy, contributions and solvency relief steps taken by the plan sponsor. The analysis of the plans in the database takes into account the index performance of various asset classes, as well as the applicable interest rates to value liabilities on a solvency basis.